Evolink protects your online business by mitigating DDoS attacks before they even reach your network. 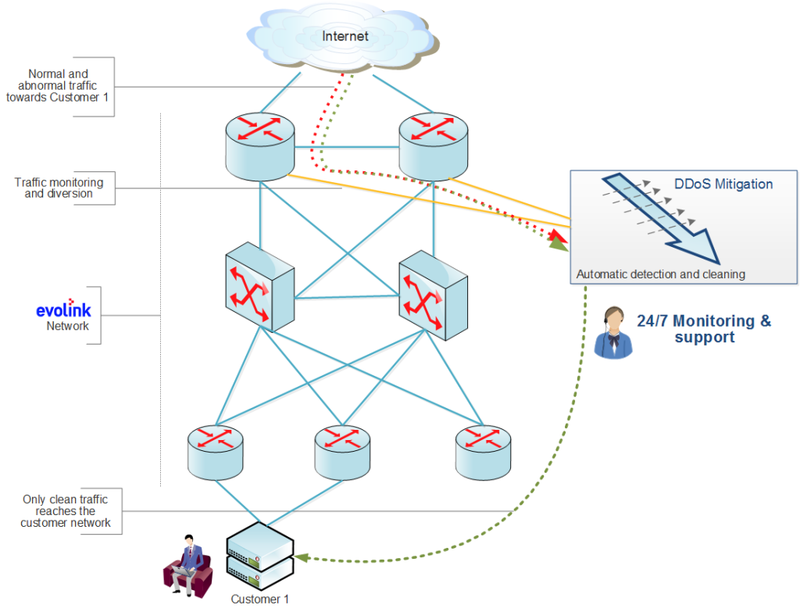 Evolink provides a scalable solution for protection against DDoS attacks. The service is implemented by complex platforms distributed across strategic locations within our network and the company’s data centers in Sofia. The service is designed for a wide range of business users who need to safeguard their online resources such as web sites, online shops, media, online gaming, financial services, and many more. The DDoS protection service works by monitoring the profile of the incoming international Internet traffic going to the protected hosts by a number of parameters. In the event of deviation from the normal profile of consumption, the suspicious traffic is sent to the cleaning platform. After a detailed analysis of this traffic, the attacking packages are removed and only the legitimate are allowed to continue to their destination. The service is available in two modes, namely automatic and manual protection. In manual protection, buyers choose whether and when to activate the analysis and cleaning of the traffic through an easy-to-manage web interface. In automatic mode protection, redirecting traffic cleaning is done entirely by the platform and does not require manual intervention either by the customer or the Evolink engineering team. In addition, Evolink offers a number of notification tools for detecting attacks and detailed reports of the type, number and nature of reported and filtered attacks. The DDoS protection does not cause latency in the IP transit service, and it helps with the management of the customer experience securing that there is no interruption in the service. In addition Evolink also provides a number of instruments such as notifications of attacks detected, detailed reports about the type, number and nature of reported and filtered attacks.